Nabbed the text of this post from Revd Lesley's blog. It moved me. I needed to share it. I once heard a story about a woman who was a high powered executive. She was planning to take early retirement and had been training for five years as a practitioner of a particular type of massage therapy. She was planning to practice this in her retirement as it gave her great pleasure and she had now mastered the art. These plans were thwarted when she tripped over a poorly laid piece of carpet in her workplace and damaged her knee, meaning that she could no longer do the massage, as she needed to be able to kneel for this particular therapy. She sued the company, and it went to mediation, and the mediator asked her what she wanted. Her reply surprised him. She did not mention money, she said she wanted an apology, for them to acknowledge how badly this accident had messed up her life. The mediator encouraged the company to apologise, and reluctantly they agreed. When they met with her they said, 'We're sorry that your fall stopped your little hobby'. Needless to say she sued them for a lot of money and their failure to apologise cost them tens of thousands of pounds. 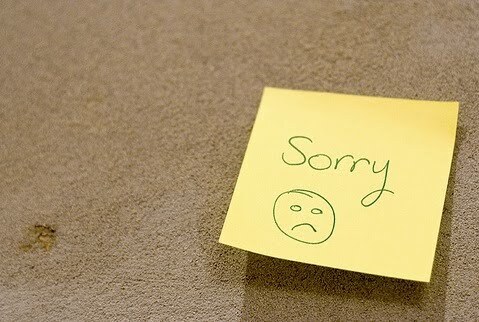 One of the best things that faith encourages us to do is to say 'I'm sorry, forgive me'. I consider myself able to say these words as I sit here now. But often the moment comes when I think to myself, 'Now I need to say sorry', and it is incredibly hard to say. The moment comes when I am still feeling angry, or hurt, or misunderstood. The moment comes when I am feeling abandonment fears. The moment comes when I am feeling lousy about myself and want to bolster my pride. The moment comes when I want to be held and reassured and I fear the impact of an admission of guilt. My friend, the mediator, says he is often amazed by the power of an apology. I guess it is in hearing an apology that we feel no longer misunderstood and isolated. The other is no longer trying to get one-up, but has taken a stance that is one-down. It takes courage, though.